Venture out of the city with trips to Polynesian Cultural Center (in Laie), Sunset Beach Park (in Haleiwa) and Kailua Beach Park (in Kailua). 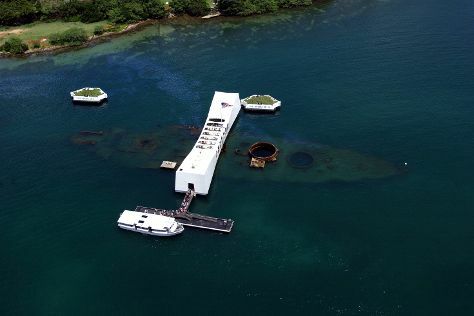 There's much more to do: take an in-depth tour of USS Arizona Memorial, look for all kinds of wild species at Hanauma Bay Nature Preserve, go for a walk through Diamond Head State Monument, and tour the pleasant surroundings at Waikiki Beach. For more things to do, reviews, maps, and more tourist information, use the Honolulu online trip builder . Cairo, Egypt to Honolulu is an approximately 25-hour flight. You'll gain 12 hours traveling from Cairo to Honolulu due to the time zone difference. Traveling from Cairo in April, expect somewhat warmer with lows of 25°C in Honolulu. Finish your sightseeing early on the 24th (Wed) so you can travel to Hilo. On the 25th (Thu), take in the dramatic scenery at Rainbow Falls, pick up some local products at Hilo Farmers Market, take in nature's colorful creations at Liliuokalani Gardens, take in nature's colorful creations at Hawaii Tropical Botanical Garden, then admire the sheer force of Akaka Falls State Park, and finally take in the exciting artwork at Extreme Exposure Fine Art Gallery. For ratings, traveler tips, and other tourist information, read our Hilo sightseeing app . Fly from Honolulu to Hilo in 2.5 hours. In April, plan for daily highs up to 32°C, and evening lows to 22°C. Finish your sightseeing early on the 25th (Thu) to allow enough time to drive to Kailua-Kona. On the 26th (Fri), see majestic marine mammals with a dolphin and whale watching tour and then fulfill a lifelong dream with a swim-with-the-dolphins experience. On your second day here, explore the wealth of natural beauty at Pu'uhonua O Honaunau National Historical Park and then enjoy the sand and surf at Hapuna Beach State Recreation Area. To find maps, where to stay, reviews, and more tourist information, refer to the Kailua-Kona day trip app . You can drive from Hilo to Kailua-Kona in 2 hours. Another option is to take a bus. In April in Kailua-Kona, expect temperatures between 33°C during the day and 26°C at night. Wrap up your sightseeing on the 27th (Sat) early enough to travel to Lahaina. 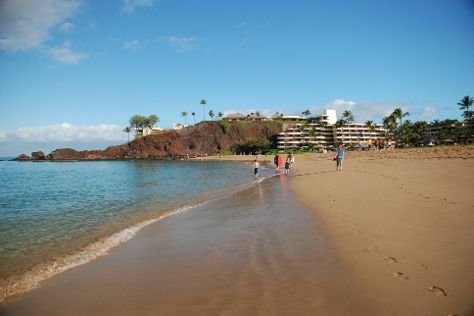 On the 28th (Sun), stroll through Napili Beach and then enjoy the sand and surf at Ka'anapali Beach. Get ready for a full day of sightseeing on the 29th (Mon): make a trip to Lahaina Banyan Court, meet the residents at Maui Ocean Center, and then see majestic marine mammals with a dolphin and whale watching tour. To see photos, reviews, and other tourist information, read Lahaina holiday maker app . Traveling by combination of flight and bus from Kailua-Kona to Lahaina takes 3.5 hours. Alternatively, you can do a combination of bus, taxi, and flight. In April, daily temperatures in Lahaina can reach 31°C, while at night they dip to 24°C. Wrap up your sightseeing on the 29th (Mon) early enough to travel to Kipahulu. On the 30th (Tue), explore and take pictures at Hana Highway - Road to Hana. Get ready for a full day of sightseeing on the 1st (Wed): tour the pleasant surroundings at Pipiwai Trail, then take in the exciting artwork at Laura Mango Art Gallery, and then contemplate the geological forces at Haleakala Crater. To find other places to visit, ratings, and tourist information, go to the Kipahulu driving holiday site . You can drive from Lahaina to Kipahulu in 3 hours. April in Kipahulu sees daily highs of 34°C and lows of 23°C at night. Finish your sightseeing early on the 1st (Wed) so you can travel back home.